How should I use the appliance for shaving? Before you use the appliance, always check the blade for damage or wear. 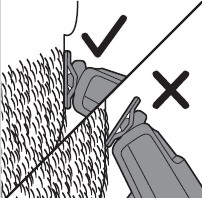 If the blade is damaged or worn, do not use the appliance, as injury may occur. Replace a damaged blade before you use the appliance. Place the blade on the skin and move the appliance up or against the grain in long strokes while pressing it lightly. Note: Make sure you hold the surface of the blade flat against your skin. Switch off and clean the appliance after every use. 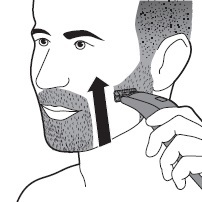 Make sure that the blade is in full contact with the skin by placing it flat on the skin. For the best result, move the appliance against the grain. Make long strokes while pressing lightly. You can use the appliance dry or wet with gel or foam, even in the shower. Shaving a clean beard and face gives the best results.